The race is beachside, the music is parkside, and the party is well and truly in the fast lane at the Vodafone Gold Coast 600! Featuring three days of Surfers Paradise street racing, don’t miss a weekend powered by entertainment! A special Friday night performance by Delta Goodrem and the epic Broadwater Sounds on Saturday night featuring an all star line up of the Hilltop Hoods, Violent Soho, Montaigne and Dean Lewis, as well as destination bars, chill zones and more, all included in your same-day ticket. 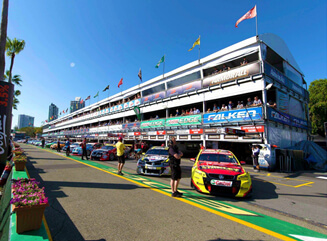 Don’t miss the PIRTEK Enduro Cup finale as the Supercar drivers fight to claim the ultimate endurance racing title! Free public transport is available on select services with a pre-purchased ticket.